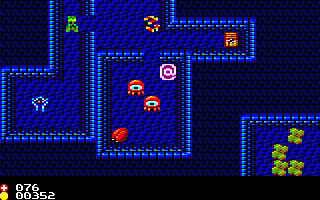 Re: Amstrad CPC 16KBs ROM Game Development Competition! 16KB meaning that this is uncompressed? No, 16 KB is the final maximum size in the ROM. Or could the game be 64KB and compressed into 16KB? Yes, the game can be up to 64 KB. It just must fit into a 16 KB ROM after compression. Anyway, here is a mock up of my game - I'm going to have to change some of the wall graphics to give it more of an angled-view-down-on-the-dungeon look and to fix issues with thin wall sections between rooms. So if I get the time to finish the game, I will hopefully end up with a nice little roguelike / rpg style game with dynamically generated levels, increasing difficulty, etc. I hope you like the coral snake, and I'm quite chuffed with the eyetopus. The screenshot is really nice, will be good to see it running. Coral snake looks nice, but hard to tell from a static screen. The Eyetopus, on the other hand... I'd buy a plush toy modeled after it! Also, I'm not sure entries should be kept secret by default. Let those who want, share their titles, and let those who don't want to, not. Click on the banner to go to the CPC Wiki dedicated page! Oooo, nice use of the MegaFlash in the picture An extra Like for that. See, fame is coming... slowly! I'll hopefully put it up as a banner on the wiki today! OMG! Just saw it's a bit less than half a year left! The deadline comes closer so quick! Ok, tonite I have to care about sound effects of one of my games, else I will have a bad concienceness for the whole weekend. - The applicant owns their work, so therefore submitted games will *ONLY* be released for sale at an agreed price if the coder expresses a desire to do so. - The games would be rated by public votes during the next two weeks after the deadline and the results will appear at 00:00 GMT on the 16th July of 2013. The second of these rules suggests that every game submitted will be available for public download in order to vote. The first of these rules sounds like it's saying that each author can choose whether the game is available for download and at what cost. Another alternative interpretation is that all the games will be available for free download, but may not be sold at cost unless the coder agrees. Obviously this option would be preferable in terms of getting more new games out into the hands of CPC owners. That is the meaning, but following your advise, we will clarify it to avoid misunderstandings. Ralf, I think it's clear enough that the game *would* be downloadable and that any paid distribution would have to be OK'ed by the authors... at least I read it clearly enough the first time around. But you raise a very, very interesting issue, that of bootleg ROMs. Indeed I'd hate for those fuckers to start making money off other people's releases. I'm not sure I'm comfortable with copyrights being passed over to the Wiki, although it would pose an advantage, reporting an auction "as the sole distributor of the software in question". Maybe just the distribution rights? PS I've installed a banner announcement on the wiki. Users can dismiss it by clicking on, erm, dunno, "dismiss". Pirates will pirate anyway, but I think that using creative commons licenses for the productions is not a bad idea. Well yes of course, but why not report them if they try something on eBay? Of course, and then you also have the backing of the CC license that you put on your production, as you are the creator of the game. Everything is easier, the authors have all the rights over their works; the games are going to be freely downloadable from the competition page, here in the CPC-Wiki; and if after the competition we could make a physical compilation with all the entries, we will request their permission for it. That's not what I meant. Of course every creator has the right to use whatever license he likes, I was just talking about the specific case of some guy selling pirate copies of your rom game on ebay. IMHO Gryzors point (or part of it) was that some suckers make money with software, which has been released free of cost. And I don't like that either. Well, we have probably to live with it. Well, in the case that someone is selling YOUR game on ebay burned into a plus cartridge, can you tell the guys on ebay that he is selling YOUR software without your approval and to cancel the sale? But what if the seller claims he is "just selling his personal copy" and want to cover his costs for the work and the EPROM? Then if there is many high bids, can we complain about it? No matter if the seller is from Poland or not? to not to allow commercial uses of my work, what can he do? Well, by accident I just had such a situation, but I emailed them a bit after the auction was closed. Their reaction was none. I don't mind people selling my crap ;-) But for a fair price, not for hundreds of Euros, because they find some poor guy who don't know better. Page created in 0.196 seconds with 97 queries.